At age 31, Vicky Collins was leading a very active life. She loved skiing in the Colorado Rockies. She enjoyed the challenge of working long hours in the Capitol Hill office of Senator John Breaux. She had met the man who would later become her fiancé. She liked nothing better than driving her white Mustang convertible with the top down, and loud music blasting. She even loved working on the engine herself. 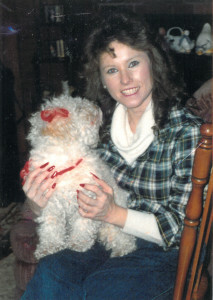 Then, in September 1991, Vicky suffered a massive stroke. Her physicians had little hope for her recovery. As a result of the stroke, she was in a coma and needed a respirator just to keep her breathing. Her family was presented with the terrible choice of whether to let her die, or let her live in what appeared to be a vegetative state. It was an agonizing week before Vicky opened her eyes. Her neurologist thought this was most likely just a reflex. Her family hoped it was more. Could she be trying to say something with her eyes? A nurse thought she was trying to communicate, and alerted her family. Vicky’s sister brought a set of alphabet letters to her bedside, and asked Vicky if she was trying to communicate. She pointed to letters and said, “Blink once if I point to the right letter, twice if I don’t.” The painfully slow process resulted in joyous news: Vicky was indeed able to communicate. In fact, Vicky’s mind was unimpaired. It was just trapped inside a body that could no longer move. Vicky’s condition is known as Locked-in Syndrome. Her mind was as active as it had been before the stroke, but she could not move her body, only her eyes. Months of physical therapy enabled her to remove the respirator and breathe on her own. She learned to lift her index finger and move her head, but she never regained the use of the rest of her body. Over time, Vicky learned that her Locked-in Syndrome might have been prevented had the blood clot, caused by a ruptured vertebral artery in her neck, been treated sooner with the appropriate medications. She was facing a lifetime of medical expenses for physical rehabilitation, medication, and round-the-clock home nursing care. She sought help from prominent malpractice attorneys who told her they could not help her. She found her way to Arlington attorneys Mark Cummings and David Sher, who agreed to take on her lawsuit. They associated with Brian Shevlin, a noted Arlington Medical Malpractice attorney. After three years of litigation, the case was settled within days of the trial. Vicky finally received sufficient compensation that allowed her to purchase a home to accommodate her special needs and pay for round-the-clock medical care. After the settlement, she asked Mark and David to manage her affairs and medical personnel. 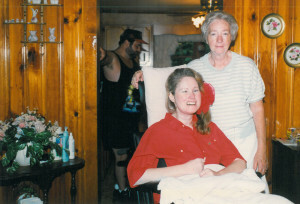 As time passed, Vicky’s hospitalizations for complications related to her paralysis became more frequent. She realized her life would be shortened by this terrible condition. She asked Mark and David to help her create a foundation that would help children with special needs after she passed. In the end, Vicky’s kidneys failed. She could have prolonged her life with dialysis, but there could be no cure and no possibility for transplant. Without dialysis, she knew she would face death in 3 or 4 days. Vicky chose to place her trust in God. She no longer wanted to prolong her life, and accepted her death with incredible courage and grace. Vicky is remembered today as a remarkable young woman who faced terrible challenges with great courage. While there were many times of anger, sorrow, and even desperation, she found great comfort in her faith. She attended weekly services at the Fort Washington Church of God where she warmly received great support and comfort from the congregation. 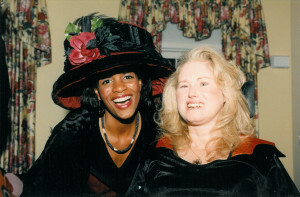 After Vicky’s passing in 2003, her foundation has awarded nearly 2 million dollars in grants to help children with special needs in the Washington Metropolitan area. The money has been used for various causes from funding the Arlington Pediatric Clinic, to providing wheelchair accessible vehicles to the families of disabled children.